Pick up a mass-marketed lager and you might find that the beer won some award at some pompous 19th-century event. Now imagine that one of these 19th-century awards had continued to this day, surviving world wars and changing tastes in beer to remain a significant prize in the 21st century. 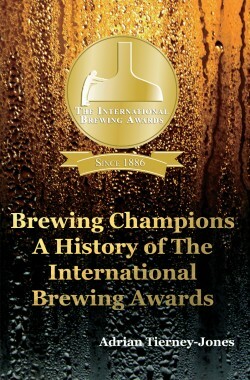 Brewing Champions (£9.99, Brewing Technology Services Ltd.) is a corporate history of the International Brewing Awards, with 125 pages of text by Adrian Tierney-Jones describing the award’s history and over 200 pages listing the award winners. Tierney-Jones is a good writer and a diligent researcher, and Brewing Champions is a significant addition to beer history. After 1901, the award has been given regularly, with three exceptions. Judging was suspended between 1914 and 1919 because of World War I and between 1939 and 1950 because of World War II and postwar rationing. In 2005, the awards were moved to Munich to be held as part of the DrinkTec exhibition. The move to Germany strained finances and caused the awards to be reorganized. They returned to Burton in 2011 and have been held there three times in this decade. The evolution of the International Brewing Awards helps mark changes in brewing history. Lager began to be judged in the 1960s. The foreign competitors, originally limited to breweries in the British Empire, became British Commonwealth awards in 1968 and international awards in 1972. “Mini breweries” made an appearance beginning in 1983. Another substantial change occurred after 1983, when the awards split from the Brewers’ Exhibition (which had been renamed “Brewex”). The trade show subsequently folded, while the awards continue to thrive. Brewing Champions is a thoughtful look at one of the brewing industry’s oldest and most important awards. To order a copy of Brewing Champions contact [email protected].